Simple Inked allows you to send an SMS or email to all of your clients, or just some of clients, in a few clicks. 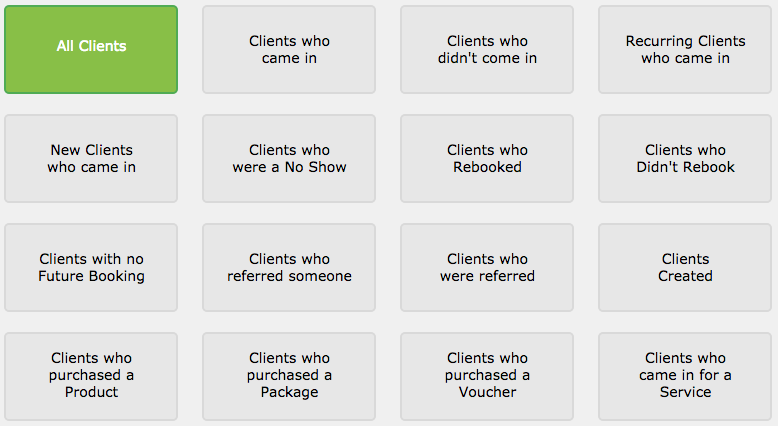 Go to your Marketing page and click All Clients. Click either Send SMS or Send Email if you want to send a message to all of your clients in this list. Alternatively, use any of the drop down menu filters to look at clients from a particular Client Category, Gender, or Referral Type. When you're ready, click Send SMS or Send Email, type message and Send. It's that easy, but very powerful.